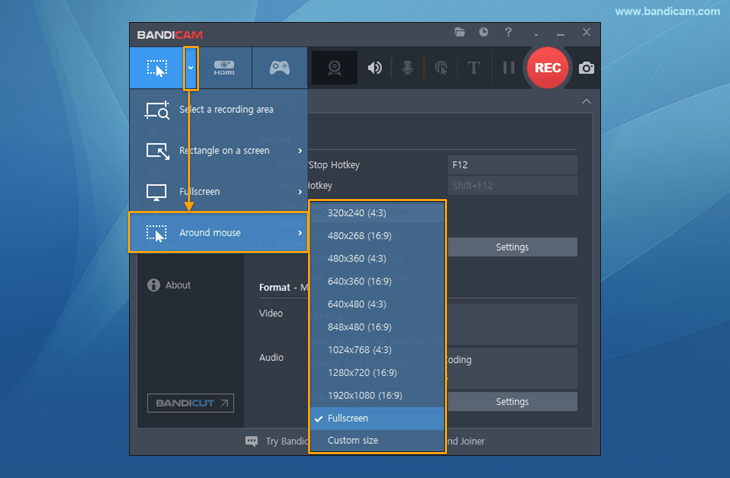 To record around the mouse cursor being moved by the user over the computer screen, start Bandicam, choose the 'Screen Recording Mode' and open the 'Around mouse' menu. The 'Around mouse' screen recording mode allows you to record the full or partial area of the computer screen while hiding the recording status bar. How to record a certain area around the mouse cursor while moving the mouse. 2. Start Bandicam and choose the 'Around mouse' mode. If you add the Bandicam icon to the taskbar, you can check the recording status while using the 'Around mouse' screen recording mode.